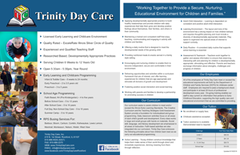 We offer several early learning and childcare enrollment options for children six weeks to twelve years old. 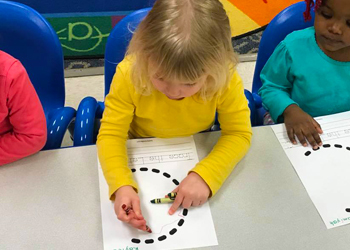 Our center is open for infant and toddler care, preschool, K-4, and school age programming from 5:30am to 5:30pm, Monday through Friday, year round. A full-time day is five or more hours of care a day. We enroll for full-time days of care three, four, or five days per week. 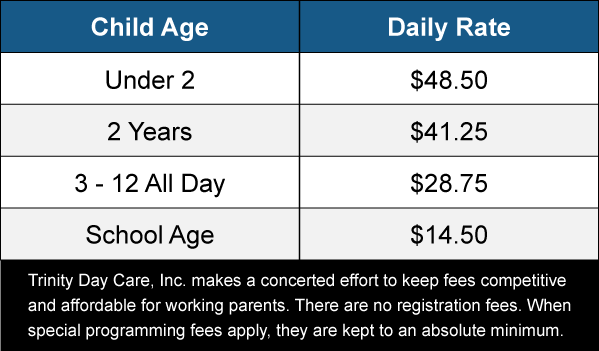 Daily arrival time requirements vary based on the age of the child and programming type. A part-time day is less than five hours of care per day. We enroll for four or five part-time days a week. We can also accomodate a combination of part and full-time days a week for three, four, or five days of care per week. We offer before and/or afterschool programming for children in kindergarten through fourth grade. Before school care is also available for fifth and sixth graders up to twelve years old. Full time care is offered for children in kindergarten through fourth grade on days off school and during summer break. Trinity receives RPS bus transportation for the following schools: Barbour, Bloom, Carlson, Conklin, Kishwaukee, Lewis Lemon, Marshall, Montessori, Nelson, Welsh, West View. We enroll seasonally when space allows, full or part-time. Call us at 815-986-KIDS(5437). Ms. Sally is the one to talk to about enrollment.